Like popular LCD monitors you commonly see used with computers, LCD TVs have a slim design and a flat viewing surface, but have been fine tuned for video display. Recent advances in flat panel LCD technology now allow for larger screens, wider viewing angles, and higher-quality video images. LCD Televisions are also competition for trendy plasma tv technology. They are several times lighter than comparably sized plasmas, and are far more durable. All LCD TVs offer progressive scan support and pleasingly flat screens by design. They also provide users with a bevy of input options, adding to their versatility. Most LDC televisions double as computer displays by allowing standard analog VGA (PC) input, a great option if you need your display to pull double duty as a PC monitor to save money and space. 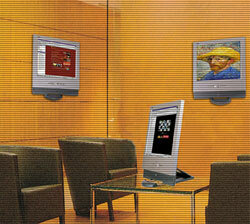 Nearly all LCD TVs offer the option to mount on a wall or under a cabinet. While many support "HDTV compatibility" and "progressive scan" as features prominently displayed on the box, don't forget that 99 percent of regular NTSC TV broadcasts and the typical DVD player won't let you take advantage of these features. How to buy a LCD TV in 8 easy steps - New! LCD TV Calibration - New! HDTV Resolutions Explained - New! LCD TV Response Time, Why it's Important - New!